Hi! I just popping in from the linky party! Come on over and visit my blog and join in my 100 follower fun! Hi! I am glad I found your blog through the linky party. I can't wait to hear about your Reader's Theater. My students love this. I am a new follower. I am so glad I found you! I am a Texas teacher too! I know you are feeling the stress I am sure of the lovely STAAR! Blah! I would love for you to come visit me. I shared not that long ago I poem I wrote titled "Teach ME" . It is a reminder to us all that we are teaching more than a test or curriculum...we are teaching a child and his or her heart. Hello, your newest follower here! I teach 5th grade myself and am actually just finishing my first month as a teacher. I really look forward to reading about your adventures and ideas! I just found your blog through the linky party...can't wait to stalk you! Hi. I am your newest follower! Come on over and visit my blog when you have a chance! I just joined your blog. I teach fifth and sixth grade. I just finished a play unit with my students. I will have to read more about your reader's theater. Found you from the linky and am your newest follower! I love your blog name...I used to teach 5th and you definitely had to be fearless at that school! 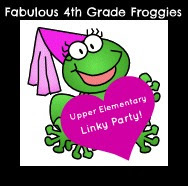 I found you through the Fabulous 4th Grade Linky and I am now following you. Your site looks great, I can't wait to explore more of your wonderful ideas. Hi :) I'm your newest follower! I am having a giveaway please make sure you check15$ in gif out my first giveaway a total in e gift cards ! !